Uptime is often taken for granted: It doesn’t become important until something bad happens. Unplanned downtime: What does it cost your business? The amount of financial resources lost due to downtime continues to grow exponentially each year. Today, more and more IT services are required to achieve extremely high levels of uptime and availability. Such is the case with SAP as NetWeaver users are increasingly looking to maintain HA in order to keep business moving as usual. This is why we are pleased to announce that SUSE Linux Enterprise for SAP Applications 12 for x86-64 has achieved SAP Certification NW-HA-CLU 7.40. For SAP customers, this means reduced unplanned downtime while ensuring continuous access to mission-critical applications and data. The new SAP SUSE cluster connector and the SUSE Linux Enterprise HAE are able to provide this service reliable. We have changed the concept of our agent to a more simple model with primitives. The cluster_connector provides more functionalities like start, stop and migrate a SAP instance. Another new feature is the possibility to run checks of the HA setup using either the command line tool sapcontrol or even the SAP management consoles. To learn more, take a look at all of the available Certified Solutions for NetWeaver and high availability. 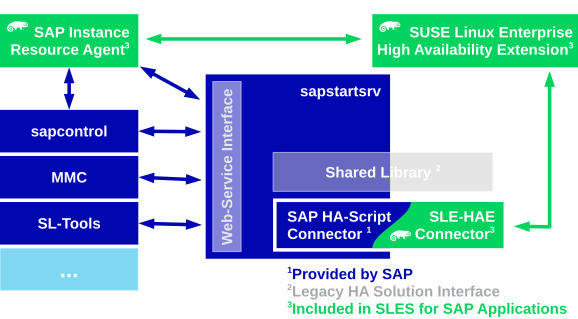 The HA extension by SUSE Linux has already been certified in the SAP Linux Lab Walldorf.